When Russians look at Iran, they see a country that has been their neighbor and rival forever. As the Russian empire advanced, it wrestled the North and South Caucasus from the Shah. Peter the Great annexed, briefly, Iran’s entire Caspian Sea coastline and put his forces just north of Tehran. In the early 20th century, Russia and Britain divided Iran into zones of influence. The Russians got the north and proceeded to occupy Iran twice, during each of the world wars. When Franklin Delano Roosevelt and Winston Churchill met with Josef Stalin in Tehran in 1943, they were protected by the Red Army. Yet there was never much love lost between the two countries. To Iranians, Russia was too powerful and too threatening. Russians, meanwhile, remembered their own embassy trauma at Iranian hands in 1829. Every schoolchild knows the fate of Alexander Griboyedov, the tsar’s ambassador to Persia, who was murdered, along with his entire embassy staff, by an angry Tehran mob. Griboyedov was a great Russian author, many of whose lines Russian children and adults know by heart. This brief background is vital to understanding where Russians are coming from as they approach Iran’s nuclear program and why they have adopted such a stop-go approach to supporting international efforts to rein it in. Although Russia has backed limited sanctions at the United Nations, it has clashed with the United States and Europe over the much tougher sanctions they are now imposing unilaterally. It strongly opposes any use of military force. Russians see their neighbor as a historical empire which now seeks to reassert itself as a regional power in the Greater Middle East. They see a young and growing population already half the size of Russia’s and a proud nation determined to rise to its full potential. They see, too, ruthless fanatics driven by some weird interpretation of their religion. Many Russians reason that if such a country wants to acquire nuclear weapons, it probably will. The only way to prevent Iran from having nuclear weapons, the Russians believe, is for the international community to craft a deal under which Iran would agree to stop after achieving nuclear-weapons capability, while the world’s leading powers would agree to reintegrate Iran into the international community by dropping sanctions, unfreezing assets and admitting Iran into the World Trade Organization. The Russians are not resigned to the prospect of Iran getting nuclear weapons. Iran, after all, is a close neighbor, meaning that even its medium-range systems can reach deep into Russia. Diplomats from Moscow have been trying hard to nudge the Iranians toward some sort of a compromise with the world’s powers and have hoped to secure special benefits in exchange for Russia’s role as a mediator in the process. Russia, as a result, is often portrayed as Iran’s ally. Yet the notion sounds strange to most Russians — and probably to most Iranians. True, Russia has been selling arms to the regime in Tehran, but Russian weapons dealers have learned to look at their trade purely as a profit-making enterprise. As for Iran, it might prefer other partners to boost its military, but doesn’t have much choice. 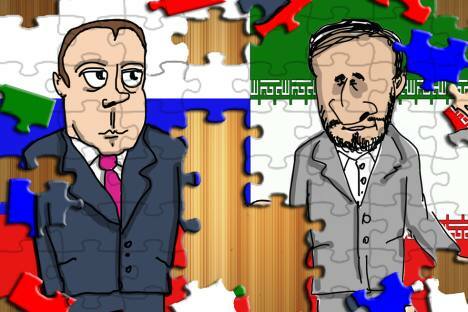 Russia is also continuing its nuclear-energy cooperation with Iran. The Bushehr reactor, Iran’s first, has been completed at long last. The Russians see nuclear energy as one of the few fields in which they are globally competitive. They look at Iran as a promising market they would be loath to cede to rivals. Russian officials, however, imposed a condition: Iran had to return all spent fuel to Russia for processing, thus preventing its use in a nuclear-weapons program. Where the assessment in Moscow does differ from that in Washington is in the scale of the Iranian threat. Russians tend to be more conservative in their estimate of Iran’s progress on their nuclear and missile programs. For a number of years after the fall of the Soviet Union, Iran turned out to be a very useful partner for Russia, particularly by abstaining from expanding its revolution to the new Muslim states of the former Soviet Union and by refusing to condemn Russia’s war in Chechnya. This pragmatic side of Iranian politics has been overshadowed by the far less cheerful streak of rhetoric from the current president, Mahmoud Ahmadinejad. Meanwhile, the supreme leader of Iran, the impervious Ayatollah Ali Khamenei, and the increasingly powerful Revolutionary Guard Corps, remain totally out of reach for officials in Moscow. Russians are watching warily as tensions around Iran continue to rise. Sanctions, they think, beyond those already authorized by the United Nations Security Council, would empower its ideologues. Russia believes that stringent sanctions imposed by the United States and its European allies won’t accomplish what the West wants — stopping the Iranian nuclear program or turning the Iranian people against their government. This means that unless diplomacy is given a last chance, the two things that concern Russian leaders the most — a U.S. war against Iran and an Iran armed with nuclear weapons — may become a reality soon. Dmitry Trenin is the director of the Carnegie Moscow Center and a foreign policy expert.